The D3 is the digital camera flagship from Nikon. Regarding sensor noise and full size sensor Nikon was some years behind its competitor Canon. The D3 is a fine camera with a proud price. It has a full frame sensor (36x24mm) with 12.1 megapixel (4256 x 2832 px) resolution. One pixel measuers about 8.4 x 8.4 μm and is relatively large. This and because they switched from CCD to CMOS technology made it possible to decrease the noise dramatically. 12 megapixel for a picture is more than enough for the most purposes. The Nikon D3X has twice the pixels but more noise at higher ISO rates. All dark frames were take at room temperature (about 20 degrees celsius). These are not exact laboratory conditions but good enough for a qualitative conclusion. I began with the longest exposure time at the highest ISO rate so one cannot argue that the camera heated up during the whole series. I gave the camera some time to coool down between every picture and the camera was locked in a closet so that no light could get in. The pictures are untreated, except for scaling. Fig. 1: Nikon D3 dark frames with different exposures and ISO rates. Whole frame scaled down to 150x100 pixel. It is clearly visible that the sensor edges are heated up by surrounding electronics and glow pink. Once these are too bright (burned out) it is not possible to remove these without quality loss from the original image by subtracting the dark frame. In the case of the D3 one has to cut off the edge or choose a shorter exposure time. If one looks at always the same part in the center of the image one sees some hot pixels. These can be subtracted from the original image using a dark frame. Fig. 2: Nikon D3 dark frames with different exposures and ISO rates. 150x100 pixel center crop. Compare the noise and pink glow to older Nikon DSLR cameras. The Nikon D70 and D200 both have a CCD sensor in DX format (ca. 24x16mm), the Nikon D3 has a new CMOS sensor in full format (36x24mm). The noise has become much less thanks to new image sensor technology and bigger pixels. Also the pink glow from the surrounding electronic's heat has almost gone. On the older cameras the image has almost burned out after 30 minutes at highest sensitivity. Fig. 3: Dark frame comparision of different Nikon SLR cameras. Shown below is the enlarged Nikon D3 dark frame '30min @ ISO 3200'. 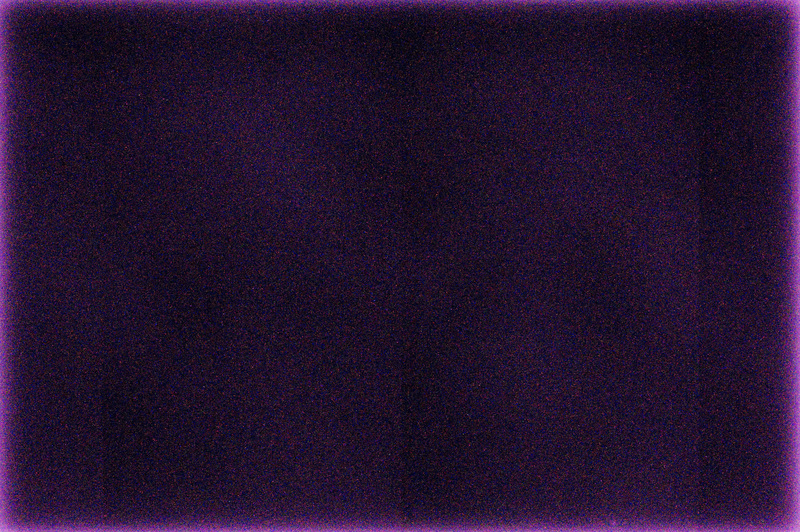 One can recognize the pink glow on the sensor edge and an interesting pattern with a rectangular structure. Maybe this is caused by slight variations in the substrate.